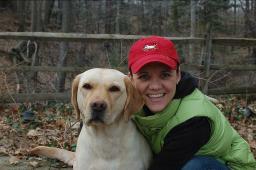 Visit www.thedogclass.com for more information, including upcoming training class schedules. For a free consultation, or to schedule a private training session, please call Marie-Josée at 216-224-2712. Be careful the your dogs don't eat the trick-or-treat candy. Chocolate can be toxic and in large doses, fatal. Wrappers can cause intestinal blockages. Many candies will result in an upset stomach. So make sure your kids keep their candy away from where your dog can reach it. Even the calmest dog might become nervous or scared by people in costumes. Give your dog a safe place to relax during trick-or-treat time or parties, away from the action. If your dog does become scared or excited, remember, as the pack leader, you need to remain calm. Reassurance is fine, but don't baby your dog or overdo it. A calm, relaxed leader will help a dog be calm and relaxed. Your dog will think, "The pack leader seems to think all is OK, so I'm OK."
Be careful your dog doesn't dart outside when you're opening the door for trick-or-treaters. Dressing your dog is a costume can be fun. But not every dog tolerates it well. If your dog doesn't like the costume, don't stress him out by insisting it be worn. Perhaps an orange and black neckerchief is enough. Make sure costumed dogs are under constant supervision so they don't become entangled in, or ingest parts of their costume. Be careful if you put a candle in a jack-o-latern that your dog doesn't knock it over. Put your hands in dog food? Yes! Another easy "pack leader" tip. Just run your hands through your dog's food before giving it to them This puts the scent of the pack leader, the one who "caught" the food on it. While there (voting for THE Dog Class), check out a great pet boutique in Rocky River, STYLE MUTT. They are offering a a great deal - $20 in treat & toys for only $10 and all you have to do is vote for them. Just type in their name in the "search for a business" box, vote for them, and you'll get the offer. Sign ups are now being held for puppies/beginners and intermediate classes starting Thursday, November 4 in Fairview Park. There will be six Thursday evening sessions, each one-hour long (no classes on Thanksgiving Day). Classes are $109 for Fairview Park residents, $119 for non-residents. You can sign up at the Gemini Center, 21225 Lorain Road in Fairview Park. Classes are held in the Fairview Park City Hall Community Room. Call me at 216-224-2712 for more details. Don't ever give out "free" treats. Make your dog earn a treat or praise, even if it's just by you asking for a simple "sit." A dog needs to understand that in the pack, the pack leader (YOU) will provide food to him. But it's not free. He has to work for it. If you begin giving your dog treats without asking for something in return, the message to him might be understood that HE is the pack leader because you are serving him, and it could undermine training. And when I feed my dogs, they must sit calmly, and wait until I let them know it's OK to eat. I am the pack leader. I hunted the food for them (as far as they know) and I will give them permission to eat the catch. The same goes for even small treats. Never pass up an opportunity to reinforce the fact that you are the pack leader. And also, never miss an opportunity to teach your dog that if he listens and does what you ask of him, he will be rewarded. These are both important in training a well-behaved and happily lead dog. Vote for THE Dog Class in the Fox 8 Hot List Contest as Cleveland's Best Dog Training. Just click here: Vote for THE Dog Class. Toby, Marie-Josée's nine year old Lab. We recently passed the evaluation testing to become a registered Delta Society therapy dog team at Fairview Hospital. 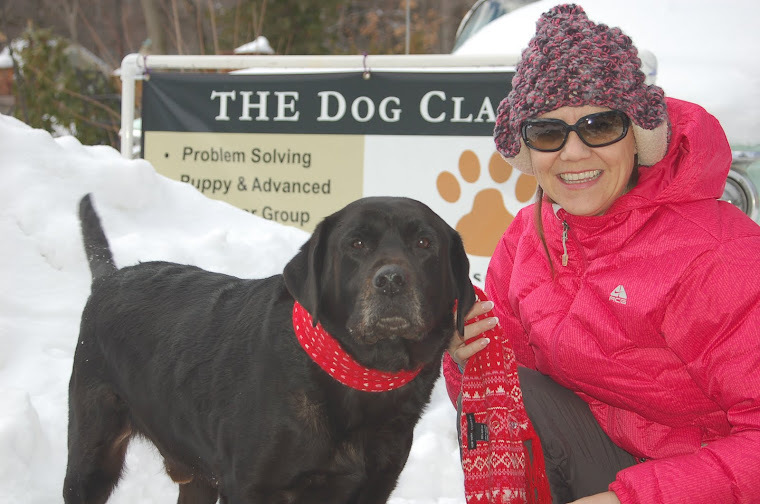 Marie-Josée Gatian of THE Dog Class is available to help you and your dog with basic training or complicated behavior problems. Only behavior reward techniques are used in training sessions. Group classes are held with puppies or dogs of a similar age. Most are six weeks long, held in one hour sessions. Private lessons are held in the comfortable surroundings of your home. Flexible hours, days or evenings, weekdays or weekends. Customized sessions to meet owner/dog needs. Click here to view a listing of upcoming group classes, location, times and enrollment information.